This is the receiver I was bragging about on the Radio index page -- the receiver that is so sensitive it can hear the local oscillator inside a small transistor radio 30 - 50 feet away. The passive or non-emissive Airband Receiver is basically an amplified "crystal radio" designed to receive nearby AM aircraft transmissions (121 - 133 MHz). shows a schematic diagram of the Aviation Receiver--a cool heterodyne AM (Amplitude Modulated) assemblage congenital about four IC's: an NE602 bifold counterbalanced mixer (U1), an MC1350 beeline IF amplifier (U2), an LM324 cloister op-amp (U3), and an LM386 audio amplifier (U4). The circuit is only superficially different to Charles Wenzel's original design. The major departure from Charles' implementation is the use of the main tank inductor as a loop antenna. The Passive Aircraft Receiver is basically an amplified "crystal radio" designed to receive nearby AM aircraft transmissions. The "passive" design uses no oscillators or other RF circuitry capable of interfering with aircraft communications so it should be fine inside the cabin of the aircraft. Civil aviation still uses AM communications between 108MHz and 136MHz. It is fairly easy to build a receiver that operates on these frequencies, however, it will also be found easy to build a receiver that won’t tune high enough! 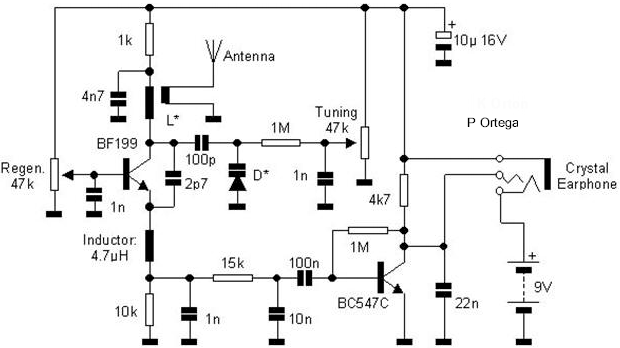 A superregenative receiver developed for tracking small FM transmitters but also tunes the aircraft band and the top portion of the FM broadcast band. Receives both AM and FM (107mHz to 135 MHz).